In 1846, Austria’s Vienna General Hospital had a maternity ward that was notorious for killing mothers and newborns. The deaths were caused by puerperal fever. You see, Vienna General was also a teaching hospital where doctors trained by cutting up cadavers. After handling corpses, doctors would head straight to the maternity ward to deliver babies. One of the doctors, Ignaz Semmelweis, wondered if puerperal fever was transmitted from the corpses to mothers during delivery. This was an era when doctors let blood stains on their gowns build up over time like a badge of honor. 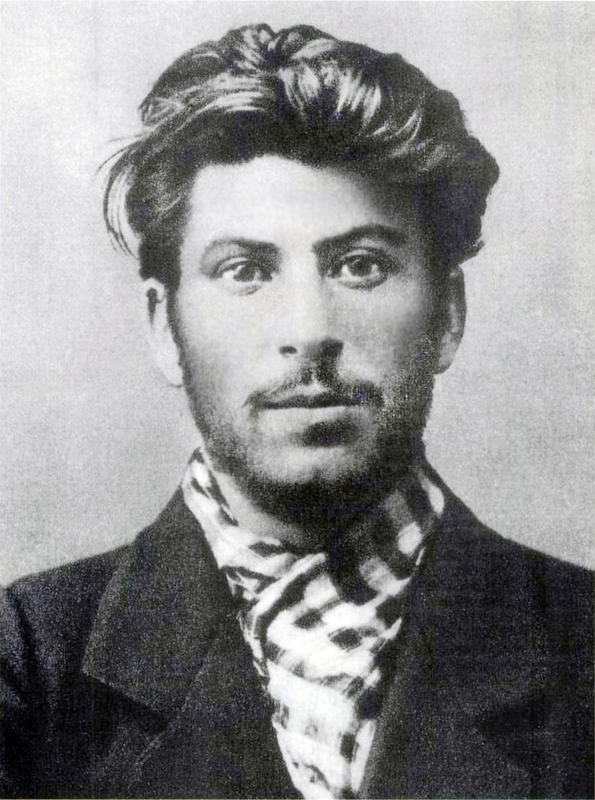 Like that old boyfriend of yours, hygiene wasn’t really a thing. When Semmelweis convinced some doctors to wash their hands, the death rate dropped enormously from thirty five to two percent. The medical community vigorously rejected Semmelweis’ hand washing idea, despite the clear evidence that hand washing saves lives. Semmelweis’ observations challenged two millennia of dogma that ruled medicine since the time of Hippocrates. The first is humorism, the belief that the body is composed of four fluids – black bile, yellow bile, phlegm, and blood – and that good health meant the balance of the four. The second is miasma theory, the belief that diseases are caused by inhaling “bad air”. Semmelweis was confined to an asylum where was has placed in a straightjacket and beaten continuously. He died after two weeks. With no one to supervise Vienna General, the doctors stopped washing their hands and the death rate went back to previous levels. It wasn’t until the time of Louis Pasteur did we discover germs and their role in diseases. As we’ll see later, it’s dogma that prevents retailers from embracing their digital future. SM fascinates me. I think it holds the key to the digital economy in the Philippines. No other local company can bring our e-commerce future to fruition in the same way SM can. Imagine you’re a 25-year old Filipino. You’ve been working for four years now since you graduated from college. You work in Net Plaza in the Fort. The business process outsourcing firm that employs you just handed your first promotion. That’s a big increase in pay, and in your credit limit on your BDO credit card. You seriously consider a car loan for that new Vios model. You eat out more. You buy more groceries. You upgrade your wardrobe. You watch movies on Imax more often. You’ll reluctantly make the weekend trip to City of Dreams because your girlfriend sees Leo’s face all over town. There’s that concert too at SM Arena. As the years go by, your savings grow and you finally have enough to make a down payment on that condo. And when you do, you’ll need to buy furniture, of course. You marry said girl and next thing you know, the kids spending your cash at Toy Kingdom. When vacation time hits, you take a trip down to Cebu, and stay in Radisson. During Christmas, the visting pinsans from abroad want to buy some handicrafts at Kultura. You’re in your late thirties now, and you decide to start a business. You hear Chinabank is offering loans for working capital, and that Citymall is offering new store space for tenants. In every single transaction above, SM made money. SM’s business spans many industries: retail, property (mall operations, residential, commercial and hospitality), banking, gaming, and even mining. If you peek at the official government stats on household expenditure, you’ll see that SM makes money on every single line item of consumer spending with the exception of communications. Wait, actually they do – indirectly – when you pay your Globe / Smart bill in an SM payments center. SM is the ultimate platform business in the Philippines. SM owns the Filipino consumer. Every single Filipino alive today and born from this day forward will contribute to SM’s bottom line at some point in their lives. Let me give you a few seconds to digest that. How would SM start? The intuitive bet is that they’ll start at e-commerce. They’ve announced this. Online banking and online real estate listings seem more like channels than business models from SM’s point of view. E-commerce is where they can leverage an unfair advantage nobody else has. To understand why, let’s first take a detour to Seattle, USA, then to China. 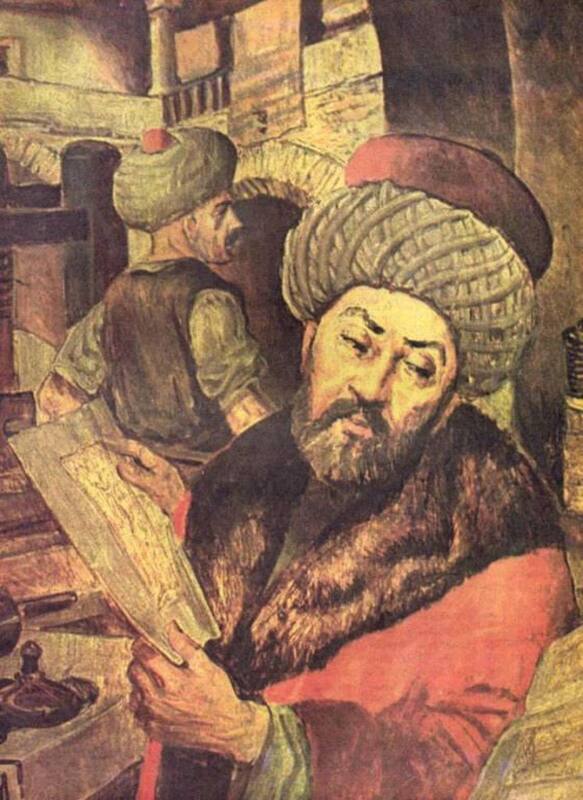 If you look at the history of e-commerce in every major market, there was always a unique set of circumstances that catalyzed the industry’s hyper growth in the early years. In the United States, e-commerce was subsidized by cheap capital. The capital markets gave Amazon an outsized valuation that allowed it to aggressively grow its customer base and its physical distribution infrastructure without much regard for profitability. That’s something that can only happen in the US. In China, the popular opinion is that e-commerce growth was driven by internet penetration, the growing middle class, and nascent demand from secondary cities. However, a prominent VC once told me that the oversupply of cheap, counterfeit goods available abundantly on Taobao was the underrated driver of e-commerce – a historical anomaly that is unique to China. In the Philippines, it’ll be SM that drives e-commerce growth. Not Lazada or Zalora. Not Ayala Land or Robinsons. Not even Globe or Smart. The popular view is that the two biggest barriers to broad e-commerce adoption are logistics and payments. Well, SM already has both. As the experience of Macy’s has shown, it turns out that a network of stores make great warehouses and fulfillment centers. Nobody talks about click and collect in-store because it’s boring, but in France, there are already 3000 e-commerce pick-up points. Two thirds of Europeans do it. Nobody else has the network of fulfillment centers SM has – a network of fully-stocked, accessible warehouses for e-commerce. These warehouses are called SM Malls, and they are 50-strong all over the country. Add a cloud-based inventory optimization layer, and we can rock and roll. SM needs to overhaul its inventory management if it wants to do omnichannel e-commerce. No other retailer has a BDO, a leading issuer of credit cards, debit cards, and online banking accounts that can subsidize the initial purchases of first-time e-commerce buyers. As far as I know, it’s only BDO that has automated online installments. Not even BPI or Citibank has this. Nobody else has the power to arm twist the country’s biggest tenants to participate by allocating inventory to an online B2B2C marketplace, lest they suffer unfavorable lease terms. 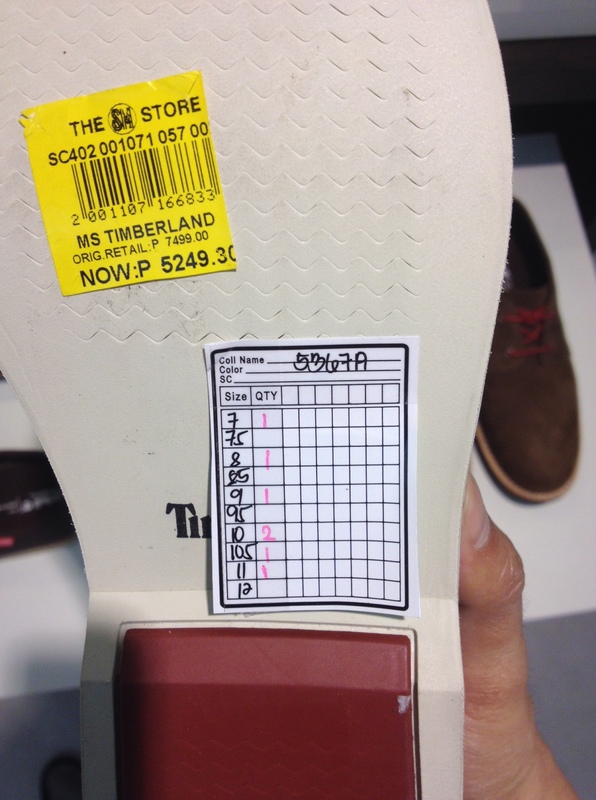 Lazada and Zalora don’t have the ability to drive down customer acquisition costs the way SM can, by simply adding a “thesmstore.com.ph” to every single mall signage, shopping bag, elevator door, parking entrance, and store receipt. Robinson’s has a far smaller retail footprint. Ayala’s new business teams are focused on health care, education, and infrastructure. San Miguel is focused on the big PPPs. Smart / Voyager’s local e-commerce operation will never have the omnichannel scale SM has. LBC is still figuring out its IT infrastructure, after its cancelled IPO. SM can do all this to catalyze e-commerce growth – that is, if SM wants to. And that’s gonna depend on how big SM thinks e-commerce can be. So how big can e-commerce be for SM and what will it cost? Let’s look at current benchmarks. The grapevine says Lazada Philippines is doing a run rate of Php 2 billion a year. That’s too small for Tessie, in my humble opinion. 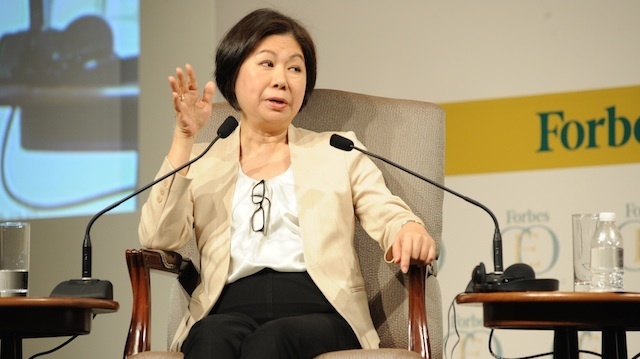 She sells more than Php 3 billion in movie tickets each year. So let’s say Tessie will only start looking at this seriously when she believes SM can do Php 4 billion in annual e-commerce sales. 40% of SM’s P197 billion retail revenues is non-food, so P4 billion is 5%. That’s reasonable given that global non-food retailers see 8% to 20% of sales in e-commerce. What will it take to achieve this? A reasonable assumption is that an average order in non-food e-commerce is worth P1,000. A Php 4 billion business implies 4 million orders each year. Let’s assume that the average customer orders 2x a year, so that’s 2 million customers. There are 34 million internet users in the Philippines, and 4 million with credit cards. Lazada has also shown that the market is willing to buy via COD – 60-70% of orders in fact. So 2 million online customers isn’t smoking pot. If we assume customer acquisition cost ranges from P300 to P800 per customer, then that’s marketing spend of P600 million to P1.6 billion a year. If we assume that the fully loaded annual labor cost per head is P700,000 and an FTE of 500 people doing e-commerce, then that’s labor cost of P350 million. Allow third party merchants to use this platform as a marketplace. This is a gargantuan task (it took Macy’s three years and counting…) so let’s say it’ll cost P400-P500 million pesos for an IT initiative of this scale (guesses on my end). The total e-commerce investment (marketing, labor, IT), will thus be P1.35 to P2.45 billion. 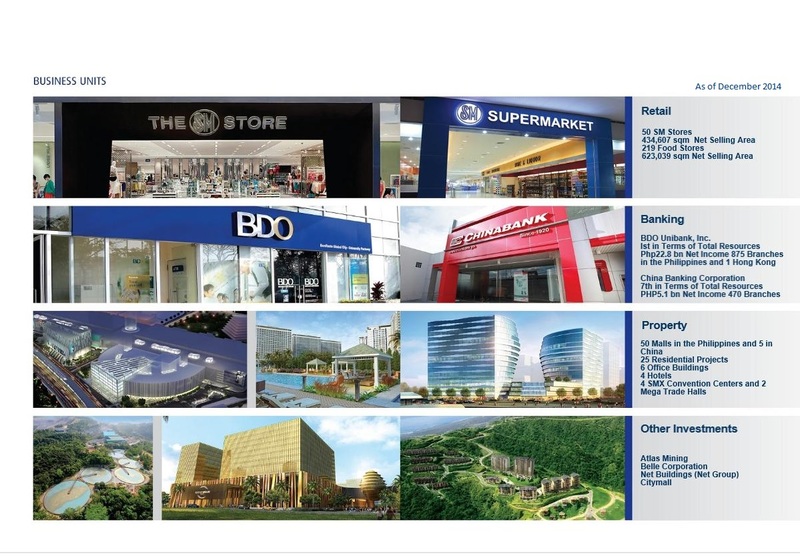 The combined 2015 capex budget of SM Investments (retail, banking) and SM Prime (property) is P82.8 billion. To dominate local e-commerce, SM just has to spend 3% of capex. A large scale e-commerce program is totally feasible. The problem is that SM’s corporate planning people will measure ROI wrongly. The assumption is that e-commerce is just another store format. They’ll do something like this: open a Microsoft excel file, estimate future sales from its online store (which, according to Similarweb, has shockingly less traffic than our niche online boutique AVA), tally up the costs, peg a discount rate, and get a net present value, IRR, and payback period. The second-order effects of an e-commerce platform (higher payments volume on BDO, higher property prices on SM condos in areas covered by same-day delivery, the intangible value of creating a strategic deterrent against market entry by Alibaba, Rakuten, or Amazon). Smart retailers like Walmart and Macy’s have learned to measure ROI not on online sales, but on total sales. This brings us back to Semmelweis and hand washing. In my humble opinion, the reason why it’s hard to make this intellectual leap for any local retailer is that the market is simply dominated by unsubstantiated dogma. Take this misinformed Cushman & Wakefield report for instance that proclaims that Filipinos “still prefer the traditional bricks and mortar stores“. Filipinos also love their mobile phones and social media. Online and offline aren’t mutually exclusive. They’re just different use cases. At AVA, 40% of our purchases are made outside of mall hours. To say that consumers “prefer” offline is missing the point – both are part of today’s shopping experience that customers expect. In a few years, there will be no such thing as “e-commerce”. It’ll just be “commerce”. Another blind spot is the belief that e-commerce is just a website with a checkout page. And because it’s a website, it can be outsourced to a web development agency. Of course, that entirely misses the point because e-commerce requires an organization steep in product management, software engineering, digital marketing, data analytics, operations, customer service, and logistics – a very different skill set from a typical retailer’s. 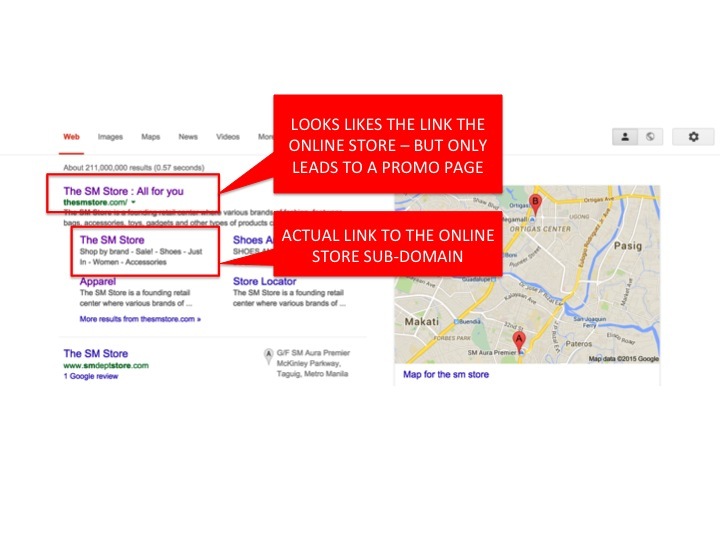 As an illustration, if you search for “SM Store”, you well get these results. 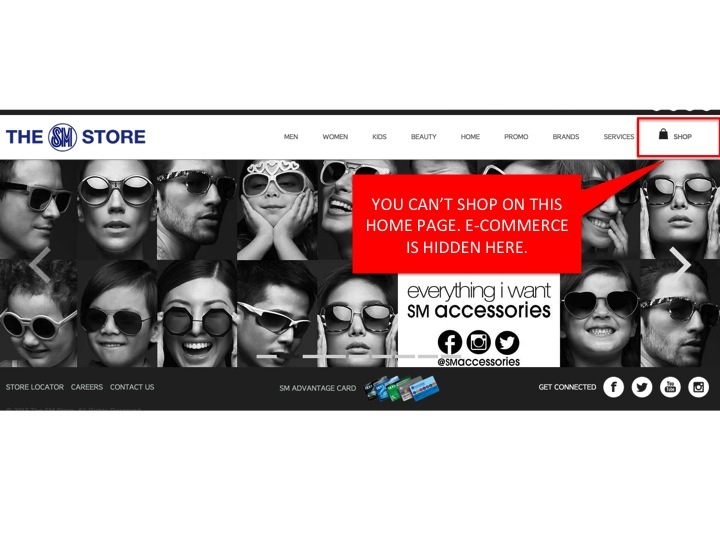 Any normal user will click on the first link.When you land on the homepage of thesmstore.com, you’ll think you can shop on this site. The nav tabs show “Men”, “Women”, “Kids” and so forth. But when you click on a category, all you’ll see are display ads for existing promos. If you want to actually shop online, you’ll have to do the extra work of either a.) finding the “Shop” button on the upper right (which as any UI person will attest, is less prominent than the upper left side), or b.) go back to search results and click on the second link. Sorry to be blunt but if the person who designed this UI worked at Rocket Internet, Voyager, or Metrodeal, he’d be fired instantly. But that’s a minor point. The more dangerous, deeply held dogma has something to do with how SM (and all local retailers) view their businesses. In 1979, at the Royal Perth Hospital in Western Australia, pathologist Robin Warren peered into his microscope and saw bacteria in a person’s stomach. Since the beginning of bacteriology, the dogma was that bacteria could not survive in the human stomach. It was too acidic and thus sterile. After much research, Warren and a colleague, Barry Marshall, discovered the bacterium H.pylori, debunking decades of dogma. H.pylori was found to cause ulcers. In 2004, Warren and Marshall won the Nobel Prize. What’s strange is this: Warren wasn’t the first pathologist to see H.pylori in the stomach. Before Warren, samples had to be taken from stomach cadavers where information was already lost. In the 1970s, the invention of the flexible endoscope allowed doctors to extract live tissue from the stomach. Tens of thousands of stomach biopsies were being made yet no doctor or scientist identified H.pylori. They had seen it, but it remained invisible. When everyone reviewed their previous biopsies, they clearly saw H.pylori right there staring them straight at the face. One scientist said, “Failing to discover H. pylori was my biggest mistake“. The scientists saw what they wanted to see – because of the “obvious facts”. The obvious fact that is causing inattentional blindness is how you look at SM’s business. SM is in retail, property, and banking, right? That’s an obvious fact. In every investor relations material, SM sees its business this way. Everyone sees SM this way. But consider this future possibility. Let’s start with your BDO credit card. It knew you bought a pair of shoes on Zalora and will thus retarget you with a better offer on the SM Store e-commerce site. When you check-out, you can either have it delivered to your Net Plaza office (geo-tagged, of course – because SM owns Net Plaza – no need to fill out the delivery form), or pick it up at Aura. If you choose the latter, it gives you 50% off a cinema ticket, or a P500 grocery voucher. Oh, by the way, when you order your groceries from the SMCart app (modeled after Instacart, naturally), you get free same day delivery if you live in an SMDC condo. But you still live with your parents, so you search for available units at SMDC’s online marketplace, which also features a mortgage comparison tool powered by BDO. When you do buy your SM condo, it includes a tool to track your power and water consumption. All of this saving and spending can be tracked on your BDO online account, which by the way you can also access on your phone. The app is so smart that it can recommend which items you can save on – and lead you directly where in an SM store you can get the savings. That’s when you realize that SM is neither in the retail, banking, or property business. It’s in the customer knowledge business. SM is a big data company masquerading as a conglomerate. And if it can incorporate a software and digital layer on its physical infrastructure, it will be a race ahead of the pack. The product isn’t a pair of shoes, or a shopping mall, or a credit card. It’s a stack of digital information that can connect separate businesses to generate an unprecedented amount of knowledge about its customers, and power a company that is more responsive to their needs and wants. And imagine if SM’s eco-system of suppliers can tap into this knowledge and customer access via open APIs and marketplaces. Robin Warren knew that the dogma pre-dated the technology of his time (flexible endoscopes), and this created an opportunity to question the current state of affairs. For SM, the dogma is the belief that it is merely in the retail business. Its flexible endoscope is the emerging boom in e-commerce, data science, and cloud computing, as well as our new understanding of network effects, winner-take-all dynamics, and platform businesses. This is the underlying philosophy that will guide SM’s digital future. I of course realize that all of this are easier said than done and there will be a lot of work ahead for local retailers. 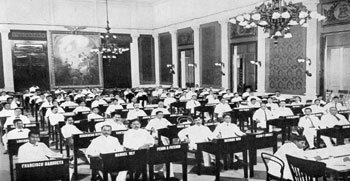 The historical predisposition of Filipino companies is to aggressively protect its turf and resist big bets. When the company decided to completely overhaul SM Makati, cannibalize itself, and banish its retail operations to the upper floors in favor of Uniqlo, H&M, and Crate & Barrel, it showed that it can evolve with the times. The stories on Semmelweis and Warren came from Kevin Ashton’s book, “How to Fly a Horse“. I enjoyed reading it. The e-commerce market in the Philippines is worth $1.1 billion. Yet, nobody really knows how Filipinos shop online. Sure, there are a number of surveys on online habits, but these tend to be flawed because they are based on claimed usage vs actual behavior. Any serious e-commerce entrepreneur needs to know this stuff. In my previous life at Procter & Gamble, where I worked on Safeguard, Olay & Whisper (yes, feminine care products. That’s a different story for a different post), this level of in-depth consumer knowledge was par for the course. We had tons of data sources. AC Nielsen retail panels. TNS household panels. Trade data. Proprietary surveys. Internal databases of concept test results vs in-market results. Media buying data. Market mix models that use multivariate regression. Big corporate machinery stuff. But when I started AVA, an online retail platform for fashion & design brands, our team didn’t have this luxury. For the past few years, we’ve gathered tons of data on the online habits of Filipino consumers. This is based on actual buying behavior. It can’t get any more empirical than this. So whether you’re a young entrepreneur creating an online brand, or an established retailer getting into e-commerce for the first time, you won’t have to start blind like we did. Tweetie de Leon and AVA partnered to launch a Kickstarter campaign to save the dying inabel fabric. 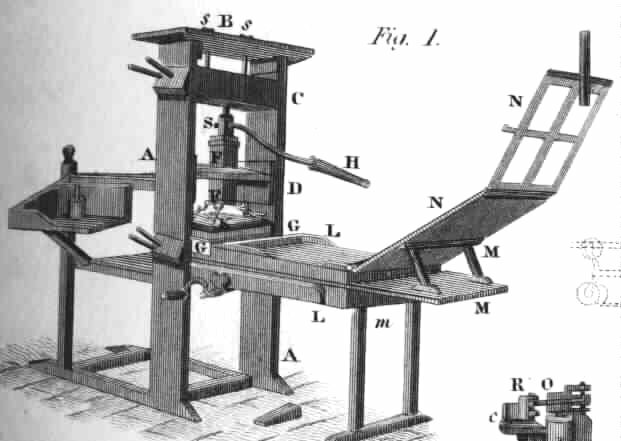 This post primarily uses two sources. First, we analyzed our actual transaction data. Second, we conduct user surveys from time to time. There are instances where we use multiple sources, of course. For instance, we combined our transaction data with our digital advertising spend to come up with our customer acquisition costs. Positioning. AVA is positioned as a premium brand. Not necessarily luxury, but not mass market either.For instance, AVA will never carry brands like Bench or Penshoppe. Some people in the industry call this segment ‘masstige’ or ‘aspirational’. Our price points reflect this positioning, and therefore this is not representative of all Filipino consumers. Merchandising. We focus on brands that target women. In fact, 95% of our customers are female. Therefore we can’t make the same conclusions for male shoppers. Geography. We have admittedly focused our marketing efforts on Metro Manila. 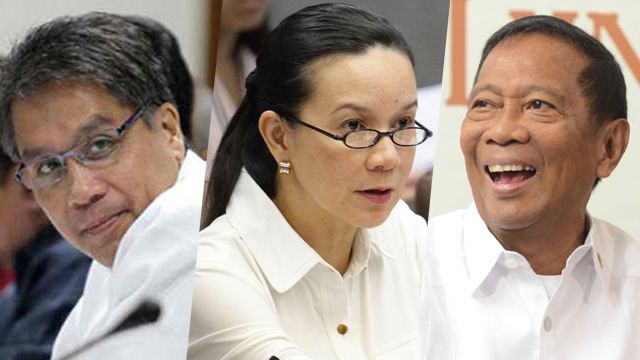 Therefore these observations won’t necessarily hold true for the entire Philippines. So what are the top things we’ve learned? 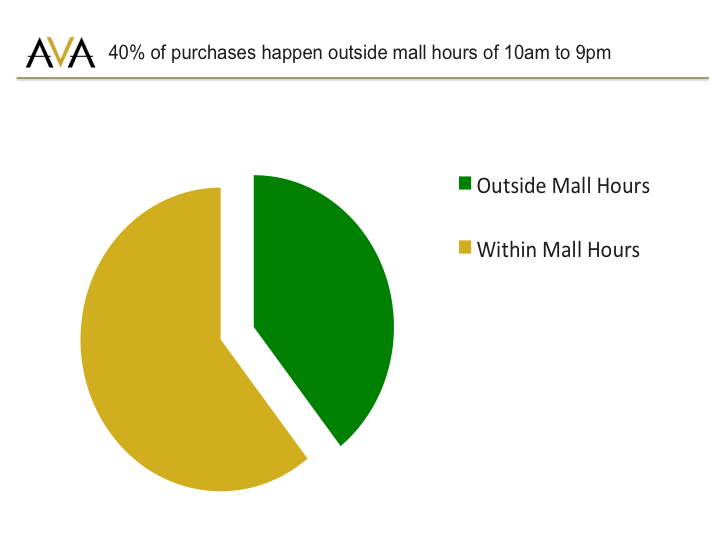 40% of purchases happen outside the mall hours of 10am to 9pm. I like starting with this data point because it rebuts the general perception that Filipinos love their malls. This is one of those things that people say again and again that everyone has accepted it as conventional truth. Yet, I’ve never seen a cohesive body of data to support it. That close to half of purchases happen outside mall hours means that consumers see the value of shopping online. 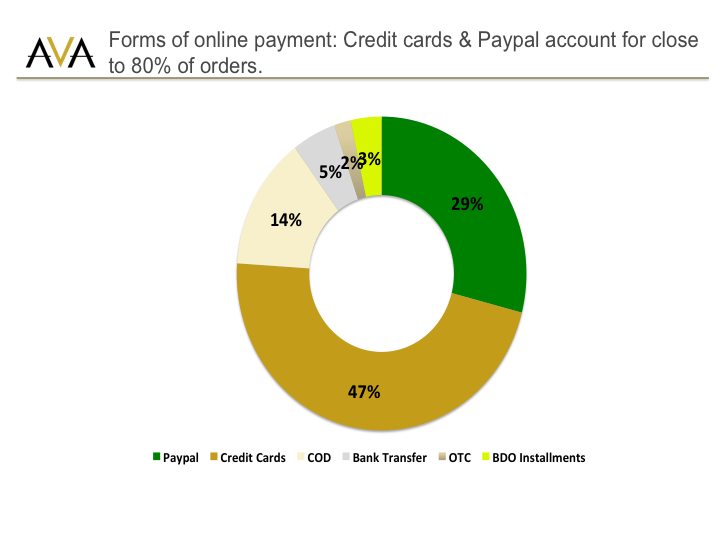 Paypal and credit cards account for almost 80% of orders. 14% of orders are COD. This is of course a result of our target market. I’ve heard that in some sites, COD is up to 70% of orders. Credit cards are preferable in the long run because despite the bank charge, a site no longer has to worry about the logistical challenges of handling, collecting and reconciling cash orders. 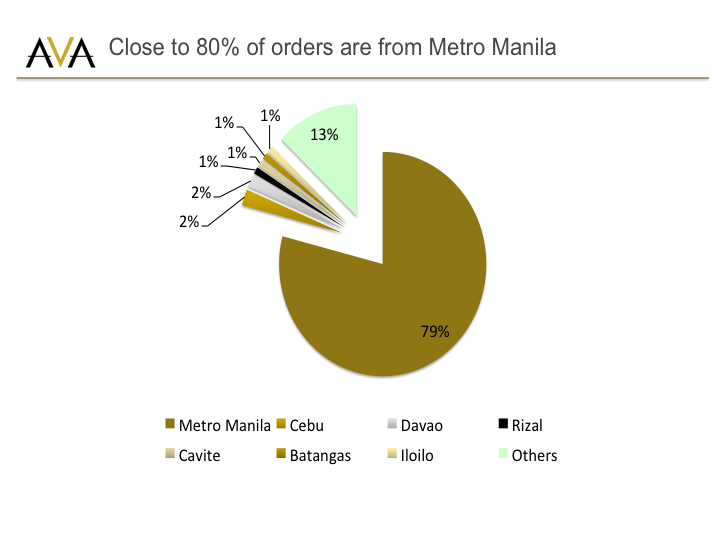 Almost 80% of orders come from in Metro Manila. That’s not the interesting point for obvious reasons. What’s interesting is the long tail: though Cebu and Davao account for 4% of orders, there are other provinces that each have a share, such as Batangas, Cavite, Rizal, and Iloilo. This is happening even though we haven’t deliberately advertised to the provinces. The implication here is that brands might consider targeted campaigns to tap the long tail of consumers in secondary cities. 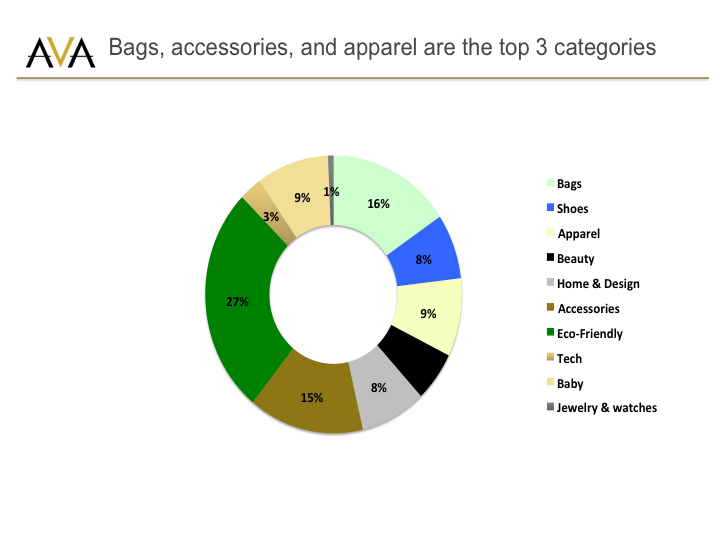 Bags (16% of orders), accessories (15%) and apparel (9%) are the top selling categories, accounting for 40% of orders. Eco-friendly is an internal, catchall term we use for products that have a sustainability or health angle, and consist mostly of accessories as well (like environmentally friendly yoga mats and home accessories). On average, customers buy 1.96 items per order. 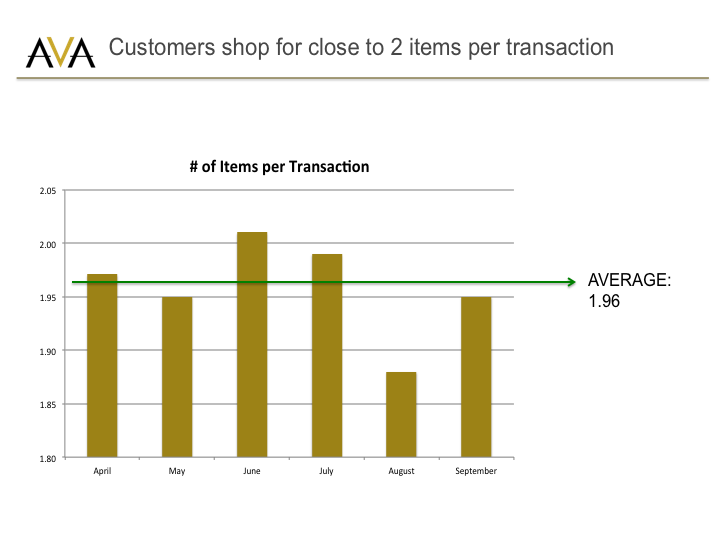 To measure this, we simply divided the total # of individual items sold by the total # of customers for that month. Here, we took the past 6 months to have a broad view of buying behavior. This is a pretty interesting point because it means that customers aren’t buying just one-off items. Online shopping is starting to mirror offline shopping habits in the sense that people are shopping multiple items in one basket. And this is just a discretionary product – fashion. I can imagine this will be higher for sites that sell groceries. 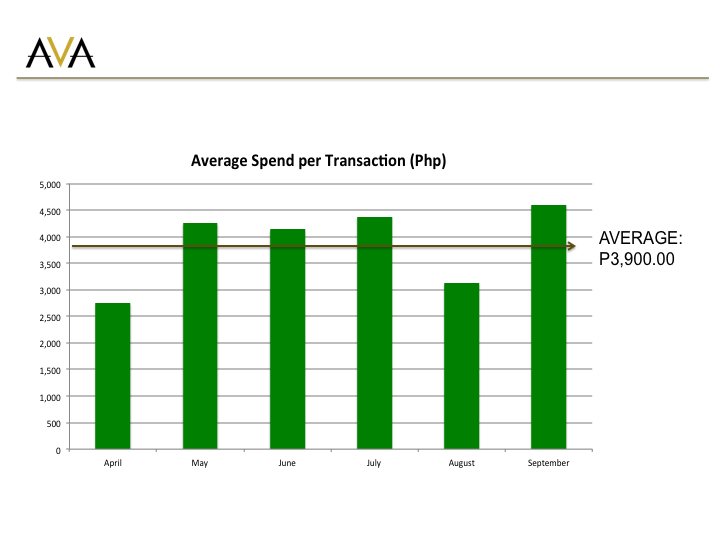 Customers spend on average P3,900 per order. As an average, this masks the range of purchases. For instance, the highest single order on the site was worth P129,000.00 (a luxury bag) and the highest spending customer has spent P306,000.00 over a one year period. Yup, you saw that right. P300k on a website. From one customer. Awesomeness. The averages also mask the importance of segments. For instance, the top quartile of our customers in terms of transaction value spend P7,300 per order (almost 2x the average) and account for 70% of sales value. We also did a survey of customers (n=321 respondents). With that, we found out that the among the most important shopping habits are: looking online to find brands consumers can’t find in the malls and to search for the best prices. 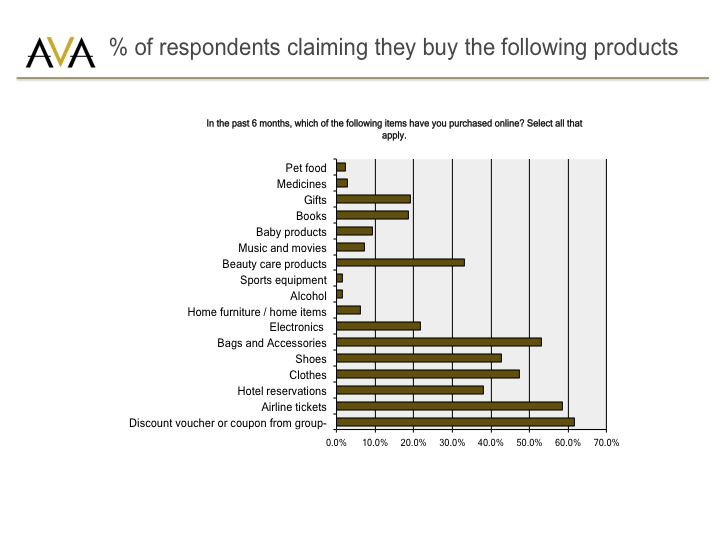 Among the other stuff people buy online include discount vouchers (60% bought in the past 6 months), airline tickets (58%), bags and accessories (53%), clothes (48%), and shoes (42%). We also asked people who haven’t purchased why they haven’t. 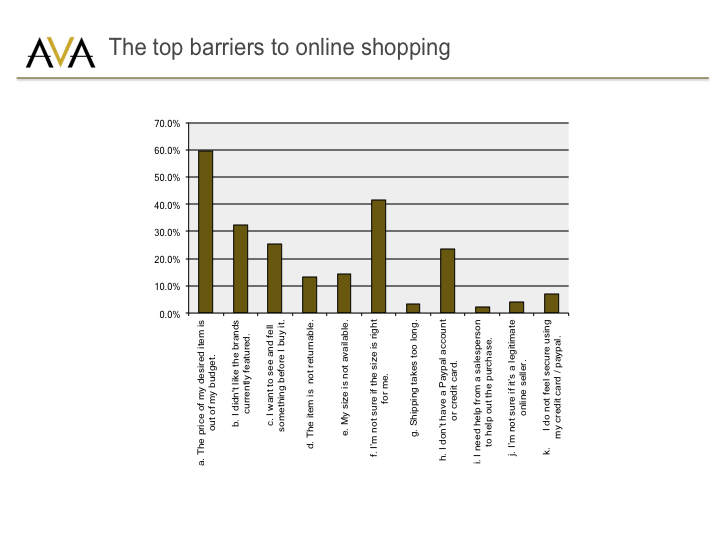 The top two barriers were price (60% of non-buyers. Probably not our market because we are not a mass market site), and sizing (40%). The fascinating point here is that only 1 out of 4 actually want to see and feel the items before they buy it. 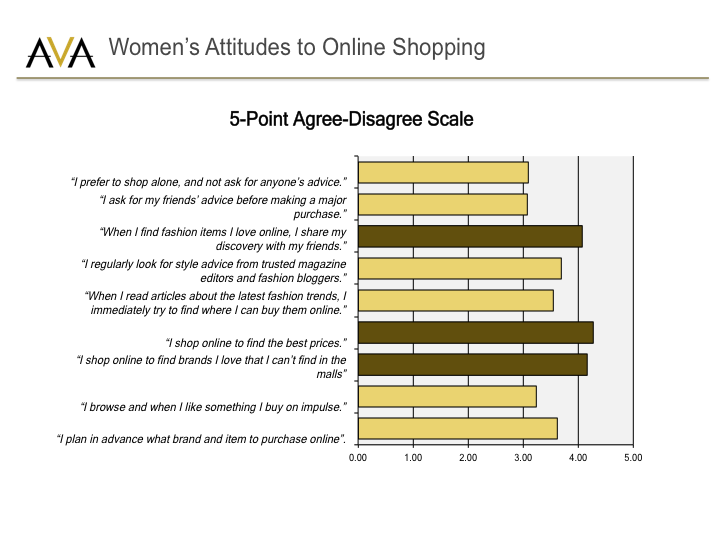 When most people express their skepticism for online shopping, this is one of the biggest concerns. But in reality, the vast majority don’t have this problem. And the 25% who want to see and feel are probably not our target market anyway. The biggest challenge of marketers is to find which customers to covet and which ones to ignore. Ok, enough with surveys. Ok let’s go back to actual buying behavior. Weekends don’t really count. 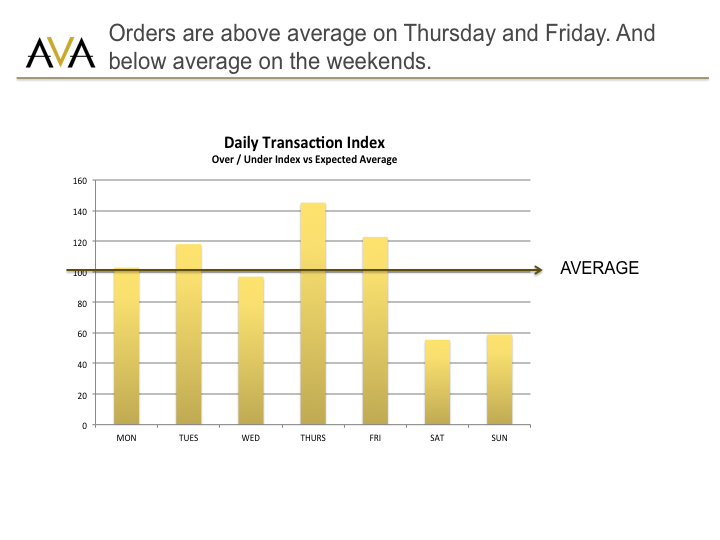 The number of orders are above average during Thursdays and Fridays and below average during Saturdays and Sundays. This echoes what others have noticed about web traffic going down on weekends. Which kinda makes sense: people go out to the malls, meet friends, exercise, etc. In our case, the average age of the AVA shopper is 34, so she is likely a young mom and would thus have a busy weekend with the family. This chart is expressed as an index. How it works: we took the % of actual daily orders that occur on Mondays, Tuesdays, and so on, and divided this by the expected daily orders (in this case, 1/7 or 14%), and rebased that to 100. Therefore an index of 140 means that the actual orders on that day is 40% higher than the expected average. The implication for e-commerce sites here is that it is probably not a good idea to spend on advertising during weekends when consumer predisposition to shop is low. The interesting part which requires further investigation is why orders over-index on Thursdays and Fridays. One explanation is that online shopping fulfills a different need – it could be more of a stress reliever after a busy week. Paydays do not significantly impact sales. One common belief is that consumers tend to shop more during paydays because they feel like they have a little bit more in their wallets. To test whether this applies to online retail as well, we took 5 distinct payday periods from May to July. Each payday period is three days long because we assume that any ‘payday effect’ could be felt for three days. Then, we hypothesized that any payday effect would result in a 200 over-index vs the daily average # of orders (or twice vs the average). We found no such over-index. 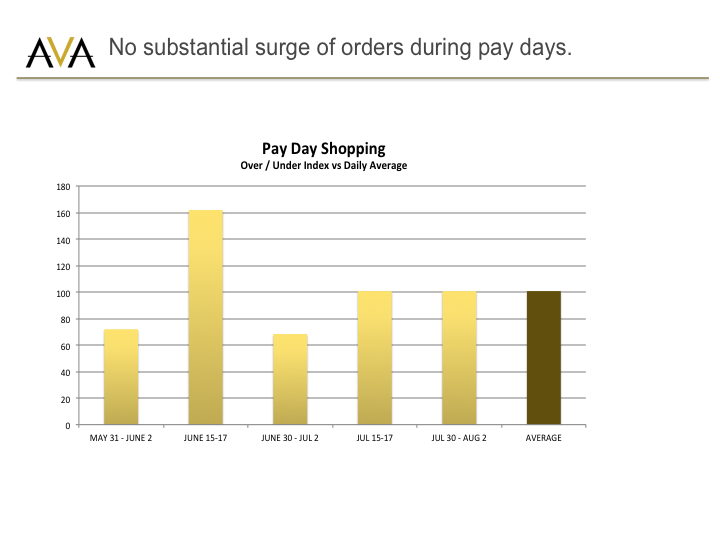 In fact, with the exception of June 15-17, our data set showed no significant surge in payday shopping to warrant a conclusion that paydays affect sales. There could be several reasons for this. One, people could be spending their money first on restaurants or bars with their friends/family. Or they could be shopping offline first before going online. This of course has real business implications. Some sites run payday promotions when in fact, it could be an unnecessary cost (in terms of margin erosion) as consumers are not predisposed to spend significantly more during paydays. 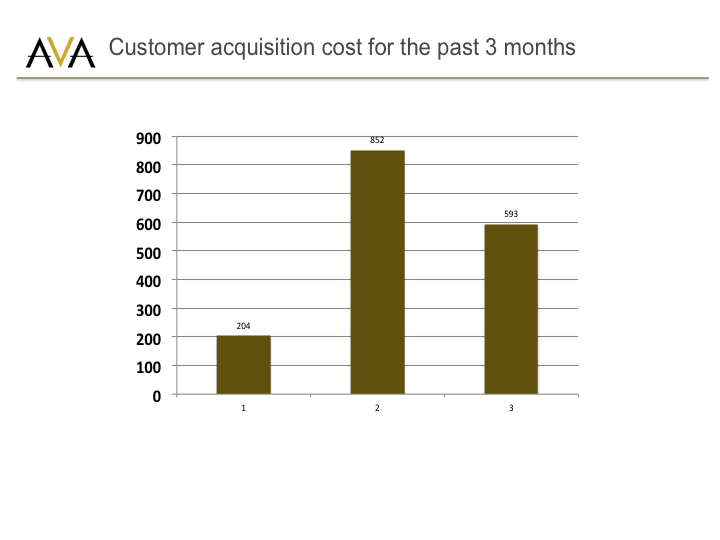 The average cost to acquire each customer is around P550. This is a pretty straightforward calculation: divide total marketing spend by the number of NEW customers per month (not total customers as this will skew CAC and make it look artificially lower). I believe we can get this lower (to the P200-P300 levels), but because we target a very specific, premium audience, the costs would be higher. Theoretically, that should be okay as long as we attract customers whose gross profitability exceeds P550. Based on our average transaction size (close to P4k) and margins, the average payback is 0.58x. That means each customer we’ve acquired online is already profitable on the 1st purchase. Anything after that is gravy. Which means this model is dependent on the # of repeat buyers. This has a huge implication for brands. For the first time ever, Filipino fashion brands can target a well-defined segment online (via social or search ads), experiment with the right merchandising mix, and profitably acquire online shoppers that can make e-commerce a sustainable channel that is ROI-positive (vs print ads which you can’t track). No need to spend excessively on branches in the malls to compete with H&M; just be fast and smart in reaching customers online. This is one reason why Globe COO Peter Bithos announced that he will start exiting print and outdoor advertising and focus on digital ads. Anyway, back to the data. So what’s repeat like? 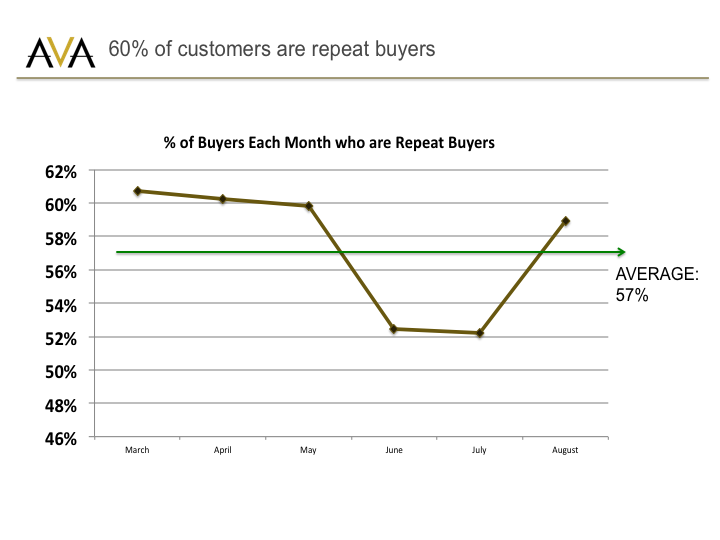 60% are repeat buyers. We think one reason for this is our focused approach on a particular segment. Another is our rewards program. 85% of our transactions result in consumers getting rewards points. What about loyalty over time? 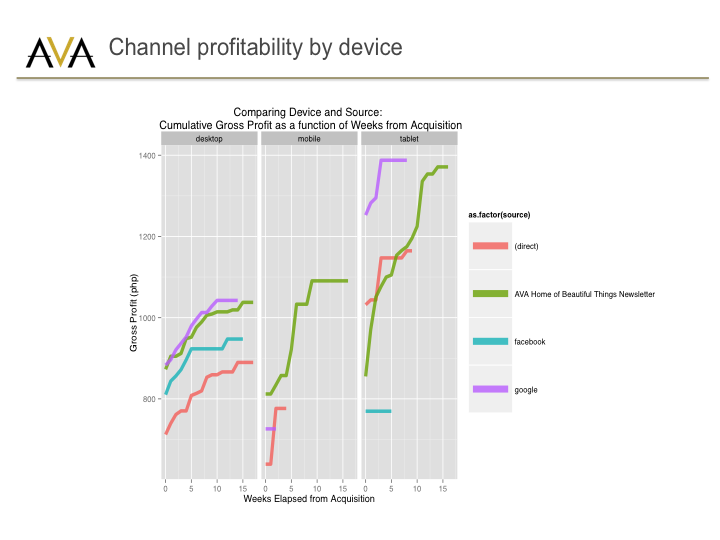 For this analysis, we worked with Ben Rollert, former data scientist at Kickstart Ventures to identify the most profitable channels and devices. What we did here is to map out the profitability of consumers who were acquired via our email newsletter vs Facebook vs Google, with their device usage (desktops vs tablets vs mobiles). What we found is that Google search on tablets produced the most profitable customers. The implication here is that brands may opt to be more aggressive with their online advertising spend depending on how these numbers look like for their specific online stores. Recall that our customer acquisition cost is P550. And if Google search ads deliver us customers who are worth P1400 in gross profit, that means we can opt to spend (at least in the 1st 15 weeks) an additional P850 in that channel (P1400 minus P550) and still have profitable customers in a year’s time. Again, these numbers will look very different for your brand. So there you have it! I hope the data above can help you formulate your own e-commerce strategy. This was just a super short overview fit for public consumption. If you’d like more data and help on building your online retail strategy and crafting digital marketing campaigns, feel free to drop me a note.